Editor’s jottin: what wi Ootlaw King hivin juist come oot on Netflex, this is the pairt aboot Robert The Bruce frae ‘Scotland’s Ain Kingly Hooses’, a series o podcasts reengin ben the history o Scotland’s kingly kinreds, written an presentit by Dr Dauvit Horsbroch o the Centre for the Scots Leid. Ye can read an listen tae the ither pairts here. Scotland’s Ain Kingly Hooses is the copyricht o Dauvit Horsbroch an haes been setten furth here wi his permission (whilk is muckle appreciatit!). Please speir at him gin ye hae ony questions effeirin til uissage. In Juin 1314 the Inglis king, Edwart II, brocht a muckle airmy intae Scotland: Inglis, Frainch, Fleemings, Germans, Erse an Welsh sodgers made up an airmy nummerin mebbe 20,000. It is jaloused that Bruce haed aboot 7,500 men. The twa met at the Bannock Burn on 23 an 24 Juin. Walcome tae pairt nine o Scotland’s Ain Kingly Hooses. In this pairt we hear aboot hou Robert The Bruce haed hissel made king an set aboot his unfreends at hame an the Soothron invaders forby. Robert I The Bruce 1306—1329 Born 11 Julie 1274 at Turnberry castle, Ayrshire, Robert wis the son o Robert Bruce o Annandale an erle o Carrick, an Magret coontess o Carrick. The Bruce faimily wis sprung fae the line o Erle Dauvit o Huntingdon an haed a guid claim on the croun o Scotland. His faither — an hissel — chynged sides in the weirs, whiles fechtin for the guardians an whiles for Edwart Langshanks o Ingland. Back an forrit the faimily gaed. It aw lippent on whither or no the guardians upheld Balliol or Bruce claims tae the croun an whither or no Langshanks micht ‘gie’ the croun tae the Bruces, pittin the faimily in an awfu swither. The young Robert’s mairiages is a clear sign o his ambition. Aboot 1295 he wis mairiet on Isabel o Mar, the dochter o Donal erle o Mar bi his wife Helen o Gwynedd. Helen wis, in turn, the dochter o Lewellen prince o Wales. This mairiage melled the kingly lines o Scotland an Wales. Isabel an Robert haed a dochter Merjory but Isabel dee’d in 1296. Sometime in 1302 Robert teuk a seicont wife, Leezabeth o Burgh. She wis the dochter o Richert o Burgh the Reid Erle o Ulster bi his kizzen Magret o Burgh. A rare choice for a guid-faither, the Reid Erle wis the maist pouerfu chiel in Ireland that’s maucht striddelt the sheuch atween the twa kintras. Robert’s ain faither, the erle o Carrick, dee’d in Aprile 1304, makkin him heid o the faimily. He haed launds an richts in his aucht, baith in Ingland and Scotland, an wis nou weel quotit in Lunnon. But in 1305 it wis weel seen that Langshanks wantit Scotland as naething mair but a pendicle o Ingland, a crounless, conquest laund. Robert haed awready made a baund, or greement, in hidlins, wi Weelum Lamberton bishop o Saunt Aundraes. The twa gree’d tae gie the ither a haunder ance the time cam, an nou Robert gaed efter the croun. The ae-maist chiel that stuid in his road wis John The Reid Cummin o Badenoch that haed ance serred as a guardian. In Februar 1306 the twa held a tryst at the Greyfreears kirk in Dumfries. Ane wird suin fasht anither, an whither it wis his ettle or no, the Bruce pullt oot a dagger an stickit the man. Tradition threaps that Bruce said ‘I think I’v killt the Cummin’ an that ane o his follaers replied ‘I’ll mak siccar’. Whitiver the truth, the Cummin wis hurtit tae the deith, an Robert haed commitit murder on haly grund. The war nae wey back sae Robert gaithert a wheen follaers an haed hissel crount king o Scots at Scoun on 25 Mairch 1306. Robert Wishart, bishop o Glesca, nou fleitcht fowk in King Robert’s cause an syne the Guid Sir Jeames Dooglas cam forrit tae fecht for him. Ance Langshanks learnt that aw his weirs haed appearinly been for naething, it gart him beel. In the simmer a Soothron airmy made its wey north plenishin itsel fae the castles an hooses o strenth in Scotland that wis yet in the Edwart ane’s aucht. An he could aye lippen on the kinsmen o the murdert Cummin. The Bruce gaithert a smaw airmy, but he wis near defait — afore he got stertit — at Meffen in Perthshire, on 19 Juin, an haed tae flee intil Argyll whaur he wis blootert a seicont time at Dalry on 11 August bi Lord John MacDougal o Lorne. Bruce’s airmy gaed aw tae staps an awbody haed tae shift for theirsels. Langshanks nou teuk bluidy vengeance on aw Bruce’s freens an kinsfowk. Bishops Lamberton an Wishart wis taen prisoner an sent in cheens tae jyles in Ingland. Sir Simon Fraser, claucht at Meffen, wis drawn an hung in Lunnon. Queen Leezabeth an Princess Merjory, sent north, wis capturt at Tain an sent til Ingland an aw. Mary Bruce, King Robert’s sister, an Isabel o Fife, that haed pit the croun on Robert’s heid at Scoun, wis gien the jyle in cages at Roxbra an Berrick. An the king’s brithers, Alisaunder, Neil an Tammas, wis drawn, heidit an quartert. 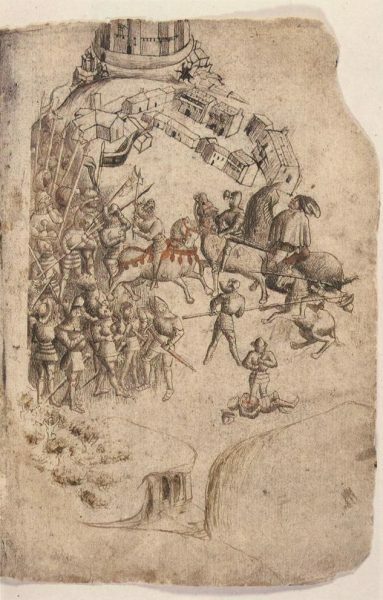 The earliest-kent depiction o the Battle o Bannockburn, fae a 1440s paper o Walter Bower’s Scotichronicon. Aiblins fleein first til Ireland, syne King Robert laundit in Carrick an Gallowa aboot Februar or Mairch 1307. In the Aprile he defait an Inglis airmy at Glen Trool, an ance mair at Loudoun Hill on 10 Mey. Nou awthing chynged. The tirran Langshanks dee’d in Julie an the Bruce set aboot blooterin his unfreends. Buchan, the Cummin faimily hertland, wis herried an brunt in 1308, an Weelum erle o Ross, ance an inemy, nou jyned King Robert. Scots that wadna come ower tae the Bruce wis hung as traitors. For twa-three year Scotland wis tore in twa. The hinmaist o the king’s inemies in Scotland, John MacDougal o Lorne, haed been defait bi the stert o 1309, an the king could even haud his first pairlament, at Saunt Aundraes, in Mairch. At thon pairlament diplomatic dealings wi King Philip IV o Fraunce wis restored, an mony kirkmen an nobles declared that Robert wis the richtfu king o Scots. 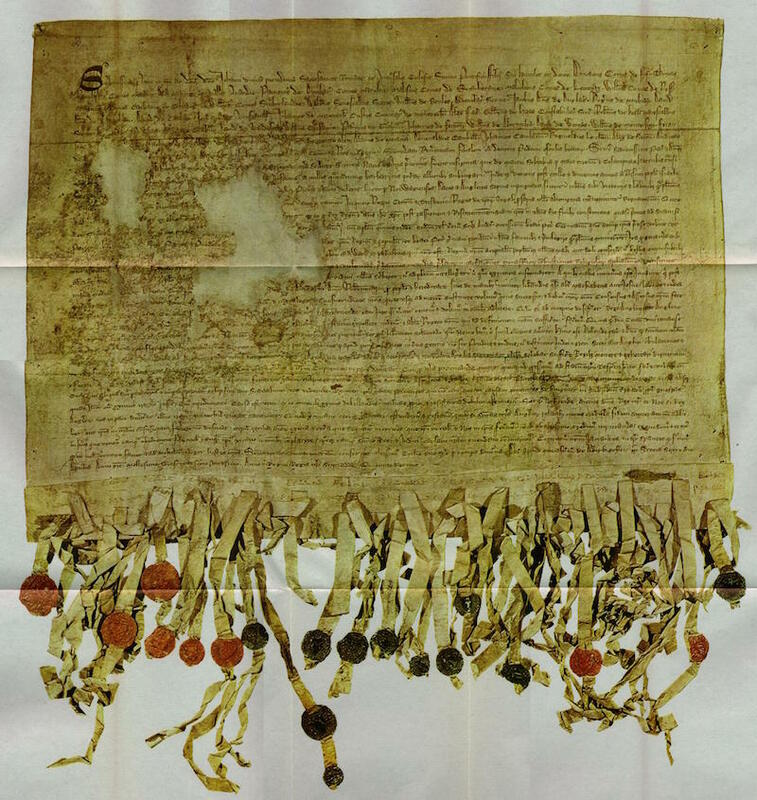 This wis follaed wi a treaty atween King Robert an King Acho V o Norrowa, sealt at Innerness in October 1312. Robert haed awready turnt his een on the launds sooth o the Forth that haed been usurpit bi the Inglis. Ding dang the castles held bi the Inglis fell tae Bruce’s men led bi his brither Edwart Bruce, the Guid Sir Jeames Dooglas, Jeames The Stewart, an Tammas Randal the king’s nevy. Bruce haed mony castles cawed doun sae that the inemy couldna haud them for steidin airmies, while his policy wis tae bicker the Inglis oot the kinrik. In the simmer o 1313 the king’s brither, Edwart Bruce, efter siegin the castle o Stirlin, gree’d wi its commander that unless an airmy fae Ingland relieved it bi midsimmer the year efter, it wad be randert tae the Scots. King Robert gied his brither an upreddin for committin them til a fecht in the open field ower the heid o ae castle. In Juin 1314 the Inglis king, Edwart II, brocht a muckle airmy intae Scotland for tae relieve Stirlin: Inglis, Frainch, Fleemings, Germans, Erse an Welsh sodgers made up an airmy nummerin mebbe 20,000. It is jaloused that Bruce haed aboot 7,500 men. While the Scots focht for their kintra, the Soothron airmy wis hauf-hertit. The twa met at the Bannock Burn on 23 an 24 Juin. On the first day, an Inglis knicht, cryed Bohun, sichtit King Robert an breinged at him. At the deith, King Robert joukit, brocht his aix doun throu Bohun’s helmet, intil his harns, an cleaved his heid in twa. This sicht fair kittelt the Scots airmy. On the seicont day the Scots schiltrons, or spearmen, follaed wi licht horse unner Sir Robert Keith, brak the Soothron airmy. It gied backs, an mony drount in the watters o the Forth. The Inglis king fled ower the border but wis that thrawart that he wadna allou that Scotland wisna his, an wadna awn Robert as king o Scots. The Scots haed taen mony prisoners, an muckle gear, an nou Scots captives in Ingland wis lowsed. Queen Leezabeth an Princess Merjory baith cam hame. Fae 1311 the Scots haed been lichtin on the north o Ingland, whiles burnin, whiles stentin touns. King Robert an his brither Edwart, an the Guid Sir Jeames Dooglas, nou lowsed deidly raids on Ingland as ane wey tae scunner Edwart II intae makkin peace. The toun o Berrick, claucht bi Langshanks years afore, wis taen back bi Scotland in 1318. Scots airmies invadit the lenth o York, an teuk siller aff o touns as the price for no makkin a greeshoch oot them. A seicont front wis opent up in Ireland atween 1314 an 1327. Edwart Bruce teuk an airmy ower an haed hissel made king o Ireland, afore he wis killt in 1318, but the fechtin thereawa left a laund aw tae sticks. Robert nou tried diplomacy wi the paip tae get him tae awn his teetle an mak Ingland dae likewise. In 1320 mony barons pit their seals tae the Scrieve fae Arbroath, written bi Bernart Linton, an sent it tae the Paip John in Rome. It wis a scrieve threapin on the lang, free history o the Scots kingship, the ettle o the Scots tae staund free, their acceptance o Bruce as king, an settin oot the wrangs duin tae them bi Ingland. But the Scots gaed forder. They telt the paip that shuid Robert no uphaud Scotland or its fowk as a freestaundin kinrik, or shuid he subject them tae the Inglis, they wad turn him oot an mak anither king. They declared ‘Sae lang as a hunner o us is in life, we winna thole the rule o the Inglis. We daena fecht for fame or riches, but for freedom alane, that nae guid man gies up but wi life itsel’. This Scrieve, an the political ettles ahint it, staunds its lane in Europe as a voice o national identity. Doobel o the ‘Tyninghame’ (1320 A.D.) copy o the Scrieve fae Arbroath. The paip an king o Fraunce threapit on peace tae the king o Ingland, an Robert made a treaty o alliance wi Chairles IV o Fraunce in Aprile 1326 whaurby ilk ane gree’d tae help the ither agin ony invasion fae Ingland. In 1327 Edwart wis made tae demit his croun til his son, Edwart III, a laddie o 14 year auld that wantit tae gie the Scots a paikin. King Robert haimmert the north o Ingland thon year, his airmies hurlin back an forrit, devaulin, the scriever John le Bel said, for tae mak an eat ait cakes, an syne awa again, leadin the stervin Soothrons a merry jig. Efter the Guid Sir Jeames haed nearly taen the young Inglis king a prisoner, by Durham, the Soothrons speirt aboot peace. 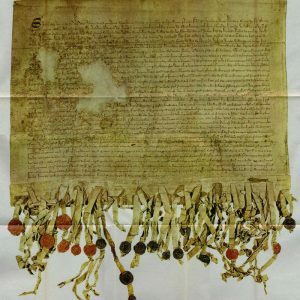 The affcome wis the Treaty o Embra, gree’d in Mairch 1328, whaurby the king o Ingland gied up aw claims til owerlordship an awned that Robert wis the richtfu king o a freestaundin Scotland. Tae mak the peace mair shuir Bruce’s son Dauvit wis mairiet on Jean the Inglis king’s sister, at Berrick on 12 Julie 1328. Dauvit wis fower year auld an Jean wis seiven. The Scots cryed their new prince’s bride Jean Mak Peace. Afore this Queen Leezabeth haed dee’d 26 October 1327 at Cullen, Banff, an wis buirit in Dumfaurlin abbey. Even while makkin the treaty o peace at Embra, King Robert haedna been weel, an wis in his bed at Halyruid whan the terms wis gree’d. It is thocht that he haed taen leprosy, an he dee’d 7 Juin 1329 at Cardross. He wis buirit at Dumfaurlin Abbey alang wi his wife. Robert haed chynged sides as a young man, he haed murdert, an tae some wis a usurper, but he haed proven hissel an haed uphauden the freedom o the kinrik, an tae this day, Robert I richtly staunds his lane as the hero king o Scots. Social media thumbnail image: Statue of Robert the Bruce, Stirling Castle, Stirling, Scotland by Aaron Bradley. Licence: CC BY-SA 2.0. 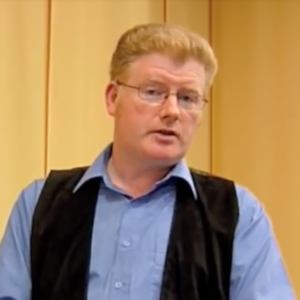 Dr Dauvit Horsbroch is the Officer for Language & Lare at the Centre for the Scots Leid. That wis a guid read. SIc an interestin historie . As a bairn growin up in the1940’s/50’s we heerd the wird ‘paips’ yaisit tae discribe folk o the catholic faith. Didnae ken it wis a Scots wird. Bein bairns we didnae connect it wi the pope an ah dinnae think ave heerd it yaisit since. It ay pleases me that ma ain laddie haes the same birth day as Robert the Bruce! Sorry, ye canna repone tae this post ony mair.